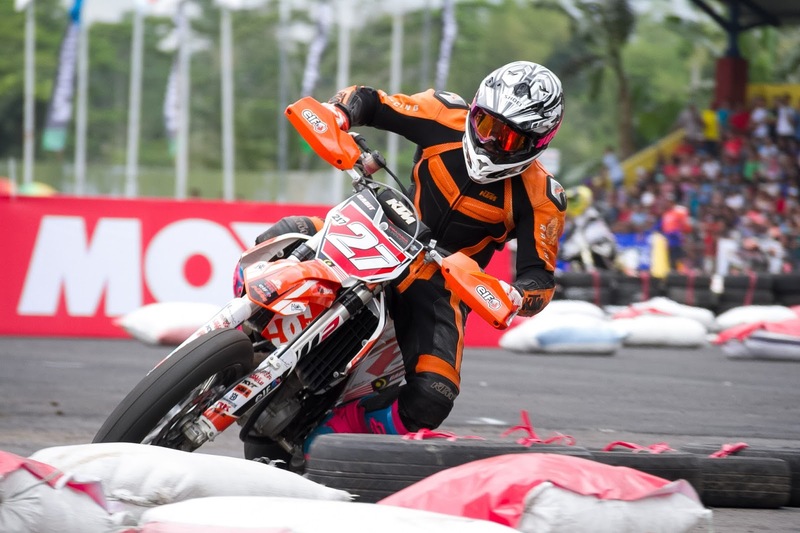 The FIM Asia Supermoto Championship created history last month when the race became the very first international Supermoto event to step foot onto Indonesian soil. This weekend, history in the motorsport is about to be made again as Round 3 of the Championship makes its way into the Philippines which will also host its first ever international Supermoto race. From the picturesque Foreshore Park of Newcastle, Australia to the spirited Kanjuruhan Stadium of Malang, Indonesia; Asia’s best Supermoto riders will convene again for the third time this year at Bayanihan Park in Angeles City to have another go at the podium and hunt for this year’s championship crown. Known as the entertainment capital of Central Luzon, Angeles City is a highly urbanised city located 80 kilometres north of Manila in the province of Pampanga. Once home to one of the largest United States Air Force Base, Angeles City is now a tourism hub which proudly boasts a wide array of historical sites and a bustling nightlife with many restaurants, bars, disco clubs and shopping outlets. One of the many attractions in the city is Bayanihan Park, a recreational park equipped with various sports facilities. Located right in the heart of the city, the park has hosted numerous festivals, carnivals and other events. It is also home to the city’s most significant and monumental landmark, the ‘Salakot Arch’. With just hours away from the race, and our riders are making all the final adjustments and tune-ups as they prepare for yet another heated battle. On this weekend’s roster, we have 14 riders contending in the Asian Class and a total of 17 riders in the run for the Open International Class. Just as each track from the previous rounds of the championship had posted its set of challenges, so will this weekend’s track. This round’s track is notably narrower with plenty of sharp corners. Spectators’ heart will skip a bit should a close competition occur at the tight hairpin on the 250 meters long off-road, which is also expected to be a crowd favourite area. While the 750 meters tarmac may seem a less challenging compared to the off-road, riders will have to race hard for the top leaderboard spot under the tight circuit across countless corners before the real challenge on dirt. Muhd Habibullah (aka Gabit), the current overall leader for both the Asian and Open International classes, believes that securing a stable position on the starting grid during the Qualifying round will be crucial for success. “The track is very narrow despite spanning over a large area. The dirt section is also covered in grass and will be very slippery. Therefore, I expect everyone to put up a fight during the qualifying round really,” says the KTM Malaysia rider. Given the track conditions, riders will find it difficult to overtake each other during the race, thus having a good starting position will be a huge determining factor. Round 3 of the FIM Asia Supermoto Championship will commence this Saturday, November 19th. Join us at Bayanihan Park and be a part of a historical Supermoto event! FIM Asia Supermoto Championship is organised by Asia Supersports Group, a consortium of three companies namely Bikenation Motorsports Sdn Bhd, CW Media Sdn Bhd and E-Plus Entertainment Productions (M) Sdn Bhd, with international supporters from the Ministry of Tourism and Culture Malaysia, Malaysia Major Events, Destination NSW, Tourism Hunter, Newcastle City Council, FIM Asia, Automobile Association of Malaysia (AAM), KYT, KTM Malaysia and Premium World Motorsports (PWM) Sdn Bhd, official distributor of Husqvarna in Malaysia. Philippine leg of this Championship Series is organised by TEN Inc., sanctioned by NAMSSA Philippines. Founded and hosted its first series in 2015, the FIM Asia Supermoto Championship is the apogee amongst supermoto races in Asia. Sanctioned by the Federation Internationale de Motorcyclisme (FIM) Asia, the race has gained its momentum since establishment and morphed into one of the pinnacles of motorsport racing in the region. Promoted by Asia Supersports Group (ASG) and organised by E-Plus Global Sdn Bhd, the 2016 series will hold its race in four countries across two continents, namely Australia, Indonesia, The Philippines and Malaysia. ASG is the official license holder of the championship. Founded in 1904, the Federation Internationale de Motocyclisme is an international organisation, which was created to control and develop the sporting and touring aspects of motorcycling and to assist motorcycle users in those fields. The FIM as defined in the statutes is the supreme and sole international authority empowered to control international motorcycling activities organised under its jurisdiction throughout the world and as such acts as the highest court for the settlement of disputes which may arise from the organisation of such events. The official titles of World Championships, Continental Championships and FIM Prize events in all disciplines of the motorcycle sport belong to the FIM. FIM Asia comprises of 28 National Motorcycle Federations in Asia where they organise a large number of events and Championships in over 30 Asian countries. Malaysia Major Events (MME) is a division of Malaysia Convention and Exhibition Bureau (MyCEB), an agency under the Ministry of Tourism and Culture, Malaysia (MoTAC). MME was established under the Government’s Economic Transformation Programme (ETP) to identify, promote, facilitate as well as support viable international events to be staged in Malaysia. With its main objective to enhance Malaysia’s economic growth and profile, MME is also tasked to identify and support major event bids for sports, arts, lifestyles and entertainment events and provide assistance to home-grown and home-hosted events in order to further strengthen Malaysia’s global appeal as the venue of choice for major events in the region. MME also acts as a conduit between the public and private sectors in ensuring seamless processes are achieved through synergistic relationships with diverse event stakeholders in staging successful events in Malaysia. Asia Supersports Group Sdn Bhd (ASG) is a consortium of 3 companies namely Bikenation Motorsports Sdn Bhd, CW Media Sdn Bhd, and E-Plus Entertainment Productions (M) Sdn Bhd. Collectively, this consortium has over 30 years of experience in the automotive and event industry in Asia. Bikenation Motorsports as the Technical Partner of ASG, bring with them years of experience of managing and organising local and international SuperMoto races. They have promoted this sport to all over Asia and have helped nurture local talents of SuperMoto riders in Asia. CW Media Sdn Bhd, ASG Media Partner, is a motoring publication company, which is also the license holders for Bonnier Corporation (Sweden) which publishes world renowned motorcycle titles such as Cycle World, Motorcyclists and Super StreetBike. In Malaysia, they publish Cycle World Malaysia and On The Road and are also the founders of MotoJamm, an international motorcycle freestyle entertainment event and www.trademysuperbike.com, Asia’s top motorcycle classifieds/e-commerce website. E-Plus Entertainment Productions (M) Sdn Bhd is ASG’s Production Partner, which is one of Malaysia’s and Asia’s top event management agency with over 20 years of experience, managing thousands of world class events. Some of the top events organised are the ATP Malaysia Open, Junior World NBA and Twin Towers Live. Incorporated in 2004, E-Plus Entertainment Productions (M) Sdn Bhd is a full-fledged one-stop events management company. The multi award-winning agency is the brainchild of a dynamic and creative team that provides innovative and creative ideas in both planning and executing events for clients, both locally and internationally. Recognised as one of the top and more experienced events management agencies in the region, the company continually seeks to elevate industry practices through its unique, creative and innovative ideas. In recent years, it has expanded operations to five other countries in the region and currently operates in Hong Kong, Indonesia, Malaysia, Philippines, Singapore, and Thailand.